From the patio door, bay window to the sides of the conservatory, our stylish custom made white vertical blinds will lighten up any window with their clean and fresh looks. Featuring high quality British parts throughout, a luxury rounded aluminium headrail, fully sewn slats and child safety features; they not only look fantastic, they are functional, extremely well made and guaranteed to operate smoothly for many years. With their inherent ability to have their louvers rotated to almost any angle they afford you complete control over the direction of the light entering the room. 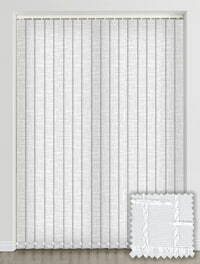 They are ideally suited to larger windows or long runs such as you get in office or commercial spaces or the windows of some homes. 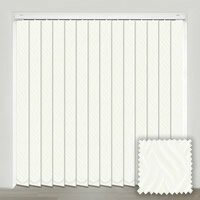 Our stylish white window blinds will add a bright and crisp look that will compliment either a contemporary or classical room setting in a wonderfully timeless way. Ordered this blind to match curtains I already had which is a near perfect colour match which was great as I didn't think I would be able to get. The blind is a good quality and fitted perfectly. Would definitely recommend this product and company. Great service. Impressed with my blind. Very good value for money. Very happy with the bathroom blind I had made and also with the order procedure.